The Tranquility® 22 Digital Series is an economical alternative for significant energy savings AND unmatched home comfort. The Tranquility® 22 Digital Series is a game-changing new geothermal heat pump that is the first in the industry to integrate digital communicating controls, 'Plug & Play' integrated variable-speed water flow, two-stage capacity, and variable-speed fan. 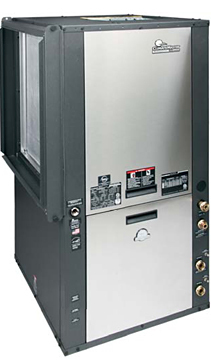 The system is engineered for quiet, efficient operation and comes in multiple capacities. ► Extra high efficiency (EER 22 / 4.1 COP) produces significant energy savings. ► Hot water generator can lower home hot water cost. ► Energy Star® Tier 3 qualified. ► MERV 7 filter removes up to nine times more dust, lasts three times longer and captures nearly 100% of pollen and spores compared to traditional fiberglass air filters. ► Energy Star® Tier 3 energy efficiency AND comfort, leveraging geothermal technology – both energy efficient and eco-friendly by harnessing the energy from the ground around the residence / business. ► Easy to install: Tranquility® 22 Digital breaks barriers never attempted before in the geothermal industry in making it the easiest geothermal system to install, period. To recap, they include, plug-and-play, communicating thermostat & configuration, small footprint and quick loop connects. ► Tranquility® 22 is engineered for safety with compressor, overflow, and freeze protection, plus a shut-down switch and fault lockout.